Nearly 140 years after the release of Louisa May Alcott’s Little Women and 70 years after the premiere of the original film comes a modern version of the timeless classic. Four sisters, each with separate dreams and aspirations, navigate adolescence and early adulthood. Through trials, triumphs, and tragedy, they strive to remain true to themselves and loyal to each other. Little Women opens in theaters nationwide tomorrow, and I had the privilege of pre-screening it. The story is a heartwarming one and is sure to have you laughing and crying along with the sisters. Jo (Sarah Davenport) is the independent first-born who dreams of writing a best-seller. Meg (Melanie Stone) is the slightly misunderstood second-born who desperately wants to be a wife and mother. Beth (Allie Jennings) is a gentle soul whose love and support for her sisters never wavers. Amy (Elise Jones and Taylor Murphy), the youngest of the four and an artist from an early age, wants nothing more than to be seen as an equal by her three older sisters. 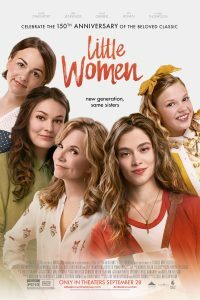 Rated PG-13, Little Women has something for both teens and adults. Younger viewers may not understand the film and should have permission from parents or guardians before watching. With a touch of romance and a whole lot of sap, the movie can certainly be considered a chick-flick. The story is primarily told in flashbacks, and although that isn’t completely obvious from the start, the flashbacks become easier to follow as the viewer gets to know the characters better. The acting is quality. Movie tickets can be purchased on the official website. I didn’t realize there was a new Little Women movie. I don’t usually like when a classic is modernized but I may give this one a shot. Thank you Ellie for your review. I was wondering. Does the movie stay true to the book even though it is modern? I was concerned about that, as well, Regina. They definitely gave it a modern twist, but I didn’t find it “overly” modern, if you know what I mean. It is still an innocent, wholesome film. They must have changed things from the book because Meg was the oldest in the book and Jo was the second born. Wait, what?! They made Jo the eldest sister in this movie?!?! That’s a good point, Jamie. It’s been a LONG time since I’ve read the book, so that had slipped my mind. Come to think of it, I don’t believe the movie specifically says who is older, but it felt to me like they were portraying Jo as the eldest sister. Let me know what you think of it, Jane. Ugh, don’t mess with the classics! Won’t be seeing this one. My son asked me for the $ to see a movie that just came out. It is his birthday this month so it was not an unreasonable idea, except that I was uncomfortable with the movie. I wish there were something equivalent to chick flicks for guys. If there is please can you give me some good ideas? What is sdo ething Mr H would like to see that is milder, than some of the recent releases that people seem so excited about? I will stick to the original. Ellie have you seen the 1990s version of Little Women with Winona Ryder and Susan Sarandon? It’s one of my favorite movies – very well done! I’d be curious how this one compares. I have, but it has been a while, so I don’t remember it well. This one is definitely a lot more modern. As soon as I discovered I was going to have a baby girl five years ago, I purchased Alcott’s Little Women, Little Men, Jo’s Boys, and Eight Cousins for her. I loved these books so much and can’t wait until she’s old enough to read through them again with her, a chapter per night!